 A language translator is at the bottom within the footer of all the Dreamscapes pages. I've always been fascinated by the symbolism that shows up within the full spectrum of art and across all cultures and all time. On this page I will highlight different artists from time to time who in my meager opinion represent the world of the unconscious, the spirit world if you will. I'll begin with a 20th century surrealist painter who seems to have captured the essence of both the waking dream and that of the sleeping dream. To him everything seemed to be a Dreamscape. The world seems both logical and irrational at the same time. Swans Reflecting Elephants (Above) reveals this world of systemized irrationality with grace. This otherworldly landscape seems strangely familiar. The luminosity of the water and sky is sharp yet serene. Visual illusions define a new type of eye movement. At first glance it appears to be a classical landscape before it turns into something somewhat unnerving and yet beautiful. This simultaneous mixture of real and unreal, rational and irrational, creates quite a sensation and conjures an eerie ambiguity. 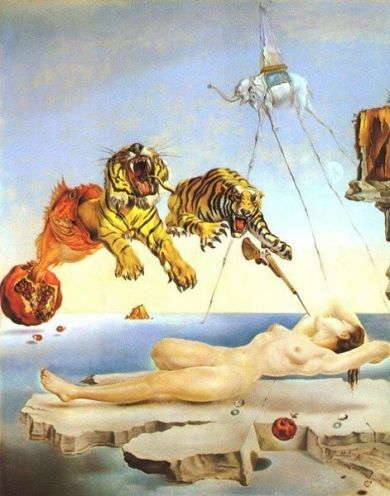 In his painting Dali depicts elements of the unconscious, but maintains the opposition between the rational and the irrational without merging one into the other. Like the mind when awake, the dream mind conjures more than one level of interpretation. It is because of this ambiguity that one needs to be open to the multitude of interpretations and meanings in life. It is ones point-of-view that describe meaning. Phenomenologically this image making and transforming of images occurs throughout our waking life. Psychologically we need to stabilize this tendency in order to work successfully within the waking world. Dreams seem to be a loosening of the psychological reigns, which tend to remain taut throughout the day. The brain chemistry of the sleeping mind is different than the waking mind, which may in part account for some of the odd and mysterious symbols that show up. How fragile this difference in dream life and waking life? His title Dream Caused by a Bumble Bee Flying Around a Pomegranate a Second Away From Awakening (Above) showed that he was aware of how delicate the line between the conscious and unconscious is. Many have posed the question 'are we all living in a dream world where the unconscious secretly dictates our every thought? Are we asleep or are we awake?' For Dalí, he poses the question somewhat differently, 'does it have to be one or the other? Are these truly separate states?' Ambiguity makes it possible for humans to ponder many interpretations of a single thing, or event. 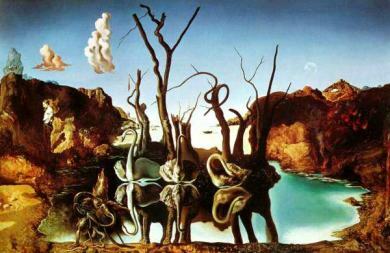 Dalí was fascinated with alternating states of thought. Note that many of his paintings appear similar to that of a dreamscape. He even goes so far as to title them after this alternative state of mind. 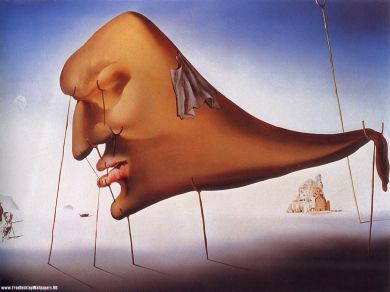 Dalí is quoted as saying, "for sleep to be possible, a whole system of crutches in psychic equilibrium is essential. If only one is missing, one would wake up and above all the little boat (in the picture) would disappear immediately." Because poetry represents the word as art, you might also browse the The Poet's Dreams page. Want to see more? Clickpage 2.